Are You Looking For A Powerful Portable Air Conditioner For A Server, Media Or Gaming Room? 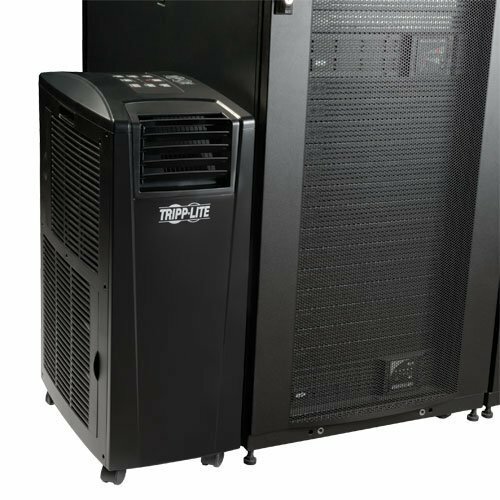 With 12,000 BTUs of cooling and dehumidifying power and a network management module, the Tripp Lite SRCOOL is a great choice. This unit won't struggle to keep the temperature under control in hot single-server or computer rooms. It can easily cool and dehumidify air in spaces as large as 500 square feet. This Tripp-Lite has a compact design that fits well in space-limited rooms and server closets, too. To monitor and operate the AC, you have the option of using the top-mounted control panel or using the optional SRCOOLNET network management module ($250). Below is our full review of the Tripp Lite SRCOOL. To see more portable ACs, check out our AC buying guide. Ceiling and window exhaust options. In case of power outage, it restarts with the last settings. This is great for unattended operation (e.g., during the weekend). Easy installation. No HVAC or tech professional needed for installation. It tends to leak if there is too much humidity. Some customers report reliability issues. This AC is huge ​on BTU capacity. It can easily handle a room as big as 500 square feet, regardless of how hot it gets. 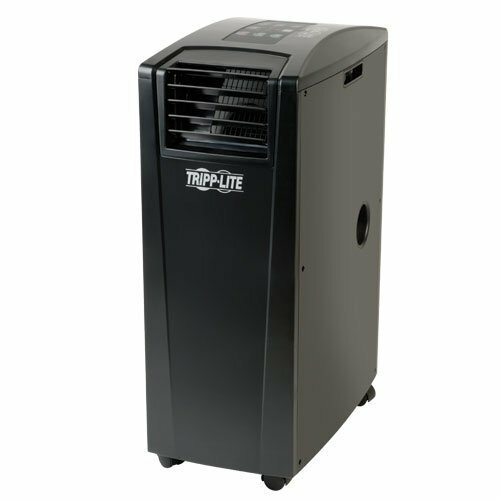 So whether you need to cool a small server closet or a large room full of computers, the Tripp Lite is a good choice. The AC provides two kinds of cooling. For large rooms where you need overall cooling, there is the general multi-directional cooling mode. Cool air escapes from the louvers at the front of the unit and spreads evenly throughout the room. You can also direct cool air towards a specific target using the vents on the side. Use the included flexible tube to duct the side vents and direct air exactly where you want it. This is ideal if you want to focus cooling on a specific server or hot spot in the room. This air conditioner uses a self-evaporative mechanism to exhaust condensed water out of the room, outside. With some limitations. If there is too much moisture in the air, the evaporator can be overwhelmed. You then have to drain the water using a drain hose manually. Otherwise, the water will start leaking on your floor. The last thing you want in a room where there are machines is water leaking. We recommend playing it safe and connecting a drain hose to protect yourself. 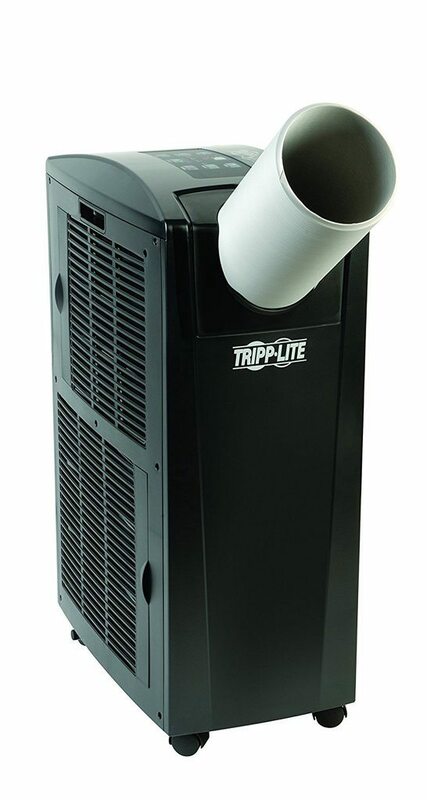 Being an industrial AC, the Tripp Lite is a bit heavy at 73.9 pounds. But it is also compact and can easily fit in smaller server and computer rooms. When you need to move it, the four casters on the underside makes portability easy. 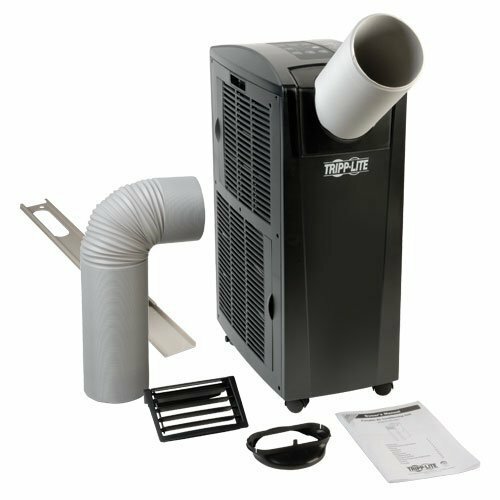 Unlike residential portable AC units that use a window venting option, this one can be vented through the window or through a dropped ceiling. It comes with kits for both types of venting. 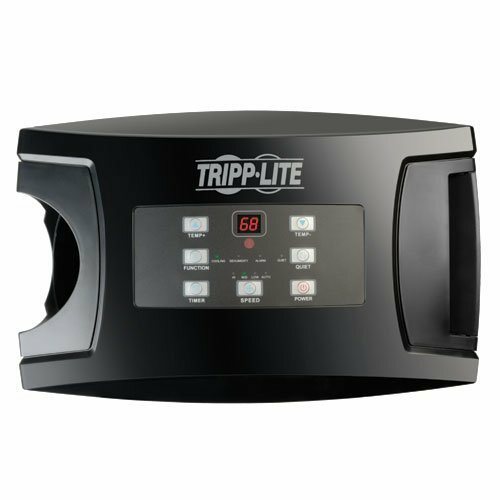 There are two ways to control the Tripp Lite portable AC. The most straightforward is by using the buttons on the control panel. The panel contains settings for temperature, operation mode, timer, and settings-lock. You can also control and monitor the AC remotely using the SRCOOLNET Network Management Module (sold separately for around $250). The module hooks up to the AC and turns it into a remote-controlled unit. From your computer anywhere in the world, you can control various settings, get alerts, review logs and monitor things like temperature and humidity. While this sounds very convenient, customers say it’s a pain to setup and use. You have to call in a tech expert and even when it’s up and running it’s anything but smooth to operate. Most just find it easier to use the physical control panel. The unit uses a process called Close-Coupled Cooling to keep temperatures down. This is different from the traditional perimeter cooling method deployed by most ACs. Close-Coupled Cooling is more effective at eliminating hot spots and uses less energy. The unit also uses an Ozone-Safe refrigerant. Additionally, it is RoHS Compliant, a directive that requires minimal use of hazardous materials during manufacturing. The biggest issue with this model is one that faces many other self-evaporative portable ACs. If there is too much humidity in the air, they tend to leak. That’s why they’ve included a drain hole at the bottom. Use it. Several customers have complained they need to regularly drain this unit manually and/or ended up connecting a drain hose. Another common complaint from customers is that the unit can develop issues a few months after installation, although it appears this may be an older, fixed issue. The manufacturer does provide live tech support. 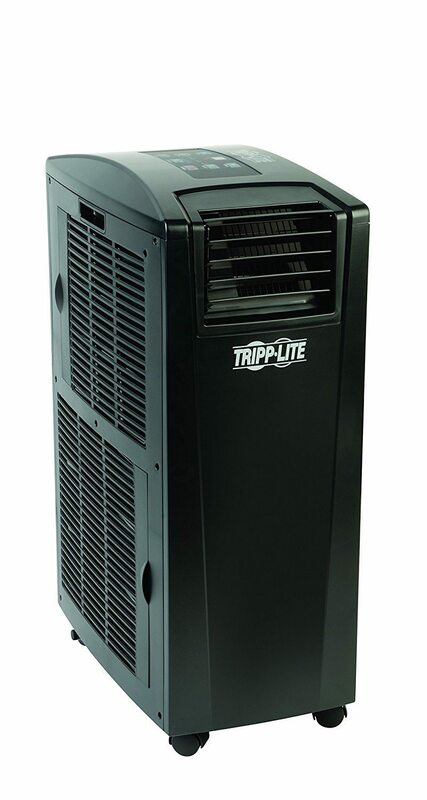 The Tripp Lite 12,000 BTU portable AC is great for computer and server rooms that can’t be served adequately by central air conditioning. Whether im a network room in your office or in your gaming den at home, this AC will keep your hardware - and you - nice and cool. We also like that the manufacturer provides free tech support and one-year warranty.